I’m going to have an exhibit! 🙂 I’m re-posting the announcement from Beterinaryo sa Fort. Hope you can drop by and check out my works! Beterinaryo sa Fort Animal Clinic brings to you watercolor paintings of cats and dogs by artist Steph Palallos (http://stephpalallos.com/) right here at the BSF facility. All her works are for sale with a portion of the sales to be donated to our favorite animal welfare charities, CARA and PAWS. The ASO’T PUSA exhibit opens on Friday, 27 September 2013 at 6PM with cocktails. This event will also introduce BSF’s new floor as we seek to provide better services to you and your fur kids in our improved facility. 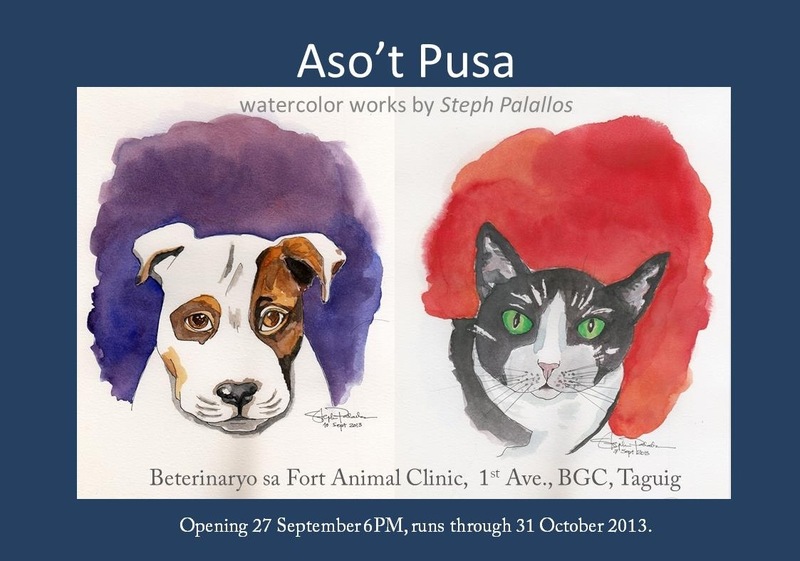 The ASO’T PUSA exhibit will run through 31 October 2013. Please drop by the clinic to see Steph’s beautiful work and maybe take one home with you.